Situated in the area known as East Denver, the Park Hill neighborhood has a charming personality with a rich history. 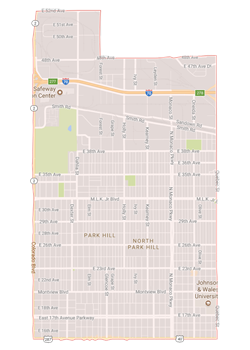 One of the most diverse areas in Denver, Park Hill is separated into three adjacent communities that that are each about a 10-minute drive to both downtown Denver and Cherry Creek. Park Hill is mostly a residential community with shopping centers and restaurants sprinkled throughout. For recreation, most locals head to neighboring City Park with its golf courses, sports leagues, and attractions such as the Denver Museum of Nature and Science and the Denver Zoo. Once known as "the finest square mile of real estate west of the Mississippi," Park Hill contains some of the most famous architecture in Denver. Ranging from Mission and Dutch Colonial style homes to Mediterranean and Victorian mansions, Park Hill real estate remains some of the most sought-after in the city. The magnificent old mansions and turn-of-the-century homes mix with newer houses along 17th Avenue Parkway and Montview Boulevard. Residents rave about how new developments haven’t changed the old feeling of the neighborhood. Park Hill made a name for itself when the professional class moved into the area during the 1950s. While many established doctors, lawyers, and business executives still call Park Hill home, good schools have attracted many young families as well.